Ananka's Diary: And the Winner Is . . . The winning entry was part of a complete spy-purse kit, which included an impressive array of brilliant products, such as "Corrosive Lip Gloss" and "Tear-Inducing Mascara." However, our judges were blown away by the sheer simplicity and usefulness of one disgusting little concept: Fake Blood Chewing Gum. It doesn't make use of the latest advances in technology, it doesn't come with a lot of bells and whistles, and you might even be able to make it yourself. But we believe Fake Blood Chewing Gum is destined to be a classic. Congratulations, Hania! You're the winner of the Perfect Gadget Contest! Here's the entry . . .
(Note: this also means you will have to store the pack of gum in a place where it will not be so easily squashed, or else you’ll end up with a mess in your bag/pocket/purse). Just remember, an over the top injury may result in an ambulance being called. Then you should run for it! Congratulations Hania!!! That is JUST SO COOL! try giving a trick o treater one of those and ask them to eat it right away! Congrats, Hania. I'm sure I speak for many of us when I say I'm kind of jealous. Lady Dahlia: For the record, you were one of the finalists. We loved the idea and your illustrations. Truly amazing! Congratulations, Hania! Genius idea. I never thought someone would take it as far as an entire handbag. Brilliant! I applaude! Can you announce the finalists? Congratulations Hania!!! (share your blessings. hehe:D) I'm jealous. Now I can't wait for the NEXT one. haha. Ooh, can you tell us what the surprise is? congrats Hania! that was a cool idea! It would be so cool if you actually made and sold them. Click "halloween," and then "Making Fiends." Wow, caongrats, Hania! That is VERY cool. Your idea is something made of evil genius. Congratulations Hania! Way to go! Aww, not mine.... oh well! Hania's was so much better then mine! That's so cool! A compact finger printing kit sounds cool! Could you post the finalists? Just so we can see how close we came to winning. I didn't come up with a single good idea. Hey, where could i get tear inducing Mascara? Lady Dahlia, yours totally cool, too!! I so wish I could have that in my purse! All in all though, I'm sure the Irregulars would have found more uses for Hania's idea (Great job, btw!). 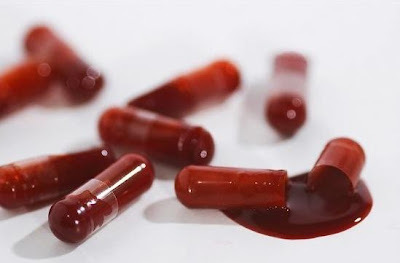 I actually have a fake blood capsule that I keep in my purse in case I need to get out of class quickly. Congratulations on winning the gadget contest, Hania! that sounds cool. i love gum but i was disgusted by it for a few days after watching nick and norah's infinite playlist. this might creep me out a little bit but it would be cool. what flavor? wow i haven't commented in forever. congratulations! congratulations! congratulations! IM SO HAPPY!!!!!!!!!!!!!!!!!!!!!!!! Hania: Woohoo'! Congradulations! My ides weren't nearly as cool, but my Mom made me go to bed before I could finish emailing Kirsten... oh well! totslly cool hania! your idea is awesome! do we get to know the surprise prize yet? loved the idea Hania! so cool!